No white flour, no butter, and no oil in these almond butter, apple, and pecan muffins. These muffins are bursting with flavor, healthy, and gluten-free! How do you feel about nuts in your baked goods? For me, when there are nuts in brownies a very good thing was ruined! I don’t like nuts in cakes or even cookies really. Okay sometimes in cookies they are okay, but on a very rare occasion. And in breads or muffins I’m not usually a fan either. But these muffins, they have some nuts in them and oh man are they good. The nuts are scarce and far between (only three tablespoons for the whole recipe), but they make these muffins! And there are actual apple bits in these ones and when they are baked it’s just an unreal taste + texture combining soft baked apples with crunchy pecans. 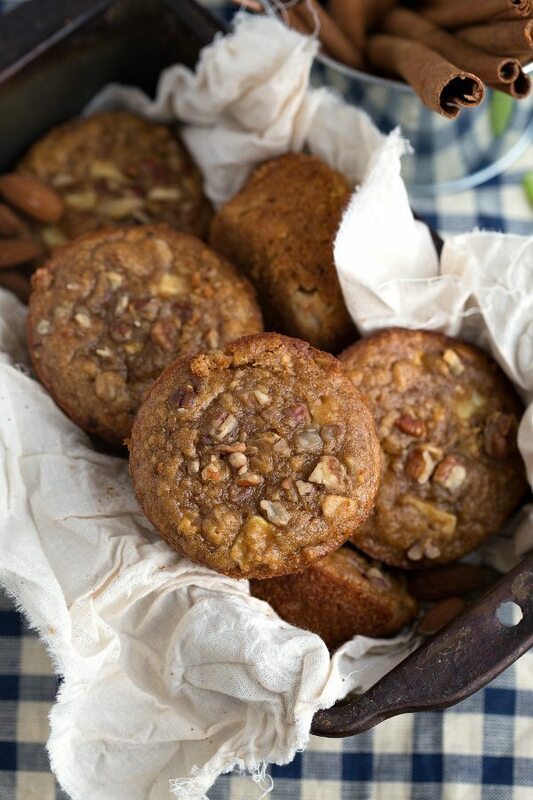 And the good news is, there aren’t just pecans, there are also almonds in these muffins – in the form of almond butter. If you haven’t ever used almond butter, this recipe is a great place to start with almond butter! You can usually find it right next to peanut butter and jams in the grocery store. And if you aren’t a fan of peanut butter, I bet you’ll love almond butter. It’s definitely a very subtle taste in these muffins and complements the cinnamon, apples, applesauce, and pecans perfectly. So there are only three tablespoons of pecans in these muffins – two get mixed in and the other one gets sprinkled on top of the muffins. BUT if you’d rather, you could be a cinnamon-pecan streusel topping on these muffins using this recipe. Such a simple topping, but I absolutely love it! Plus it’s pretty stinkin’ healthy. For the apple in this recipe, try and get a tart one that has a lot of flavor. I used a Granny Smith apple, but if you don’t like that variety use another one. The peel and core gets removed, and then you just quickly and coarsely chop up the apple. These muffins are supposed to be quick to make! They also freeze and re-heat really well. So if you want to make a bunch and have ready-to-go breakfasts that you pull out of the freezer and warm in the microwave – well this is your recipe! As far as the yield for this recipe – these make about 8-9. I filled up 8 muffin cavities pretty full and those are the muffins pictured here. I also made a batch with 9 muffins which worked great as well, they just weren’t as big. One last note – try not to over-mix the batter. It makes the muffins more dense if you do. Mix until *just combined* and these are ready to go into the oven. Okay enough talking; time to get these in the oven!! Preheat the oven to 350 degrees F. Spray 8-9 cavities with nonstick spray and fill the other ones halfway up with water (ensures even baking). Do not use muffin liners. Beat together the applesauce, almond butter, honey, vanilla extract, and brown sugar in a large bowl. Beat in the egg. Beat in the salt, baking soda, baking powder, and oat flour. To make oat flour, take oats and pulse them in a blender or food processor until they are in a flour like consistency. Make sure to measure the oat flour AFTER blending and not before or the amounts will be off. Stir in the old-fashioned oats. Remove the peel and core of an apple and finely chop the apple into small pieces. Mix with the lemon juice and then add the apples to the mixture along with 2 tablespoons of chopped pecans. Using a cookie scoop, scoop two full scoops of the dough into each muffin cavity. If you want larger muffins only fill 8 of the cavities. If you'd rather have more muffins fill up 9. Evenly disperse the last tablespoon (or two) of pecans among the muffins. Bake at 350 degrees for 16-18 minutes. I find that slightly under-baking these muffins makes them taste more moist and light. If you don't like that though, bake them a little longer, just watch them carefully so they don't burn. *If you want your muffins sweeter, increase brown sugar by 1-2 tablespoons. **Make sure oats are certified gluten-free to have a gluten-free muffin. Can you substitute flour for oats? what would the ratio be? I most definitely do not like nuts in my baked goods but for some reason I do like them in muffins and breads as well! I am craving one of this lil muffins with my morning coffee right meow. Pinned! What type of oats are you using? I’m new to this and am not sure. Just regular old fashioned oats that I blended in my blender 🙂 hope that helps!! I love nuts in baked goods so that doesn’t bother me! These look fantastic! And I love that you have almond butter in them too – my favorite! Hope you’re having a great weekend! 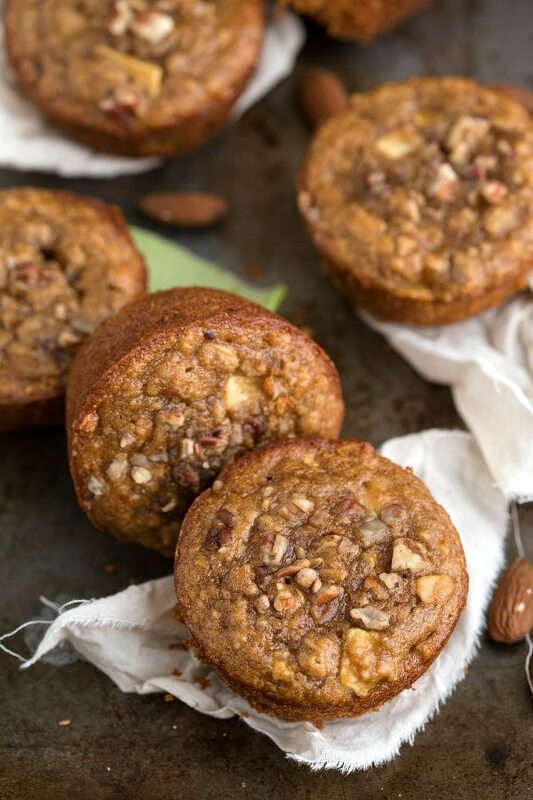 I love nuts in baked goods and these muffins sound pretty perfect to me! Bonus points that they are healthy! these look delicious! pinning these 😉 i love how healthy and the flavor combo YUM! I would love few for breakfast.. 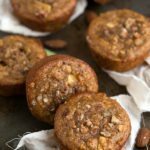 I wasn’t always a fan of nuts in baked goods but now I love them – especially in muffins 🙂 These look absolutely delicious! Love the almond butter in here and the fact that they are healthy – that means I can have more right?? 🙂 Pinning of course and hope you have a great rest of the weekend sweet lady! You are the sweetest Kelly!! Thanks so much; I hope you have a great Sunday! 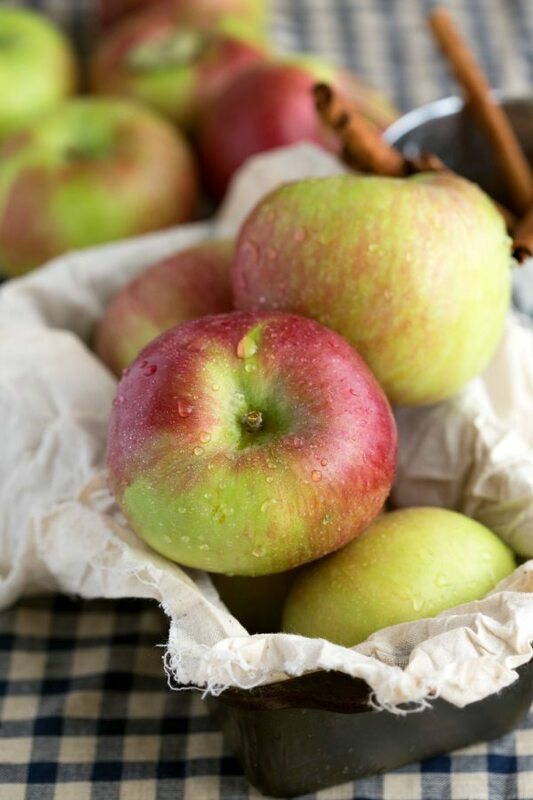 These apple muffins look perfect for this time of year! 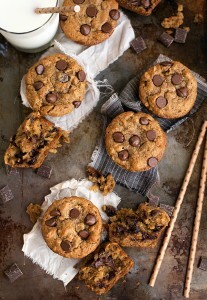 I love baking with almond butter and oat flour and will have to try these soon! YES!! It’s like you read my mind!! I hate nuts in almost all things baked — especially brownies. Why ruin a perfectly good extra fudgy brownie with nuts?? I always pick them out and eat them separately… Strange but true. 😉 These muffins look incredible — so perfect for the cozy fall weather! Pinned! Great recipe Chelsea! Healthy AND gluten free! Awesomeness! Pinned! These are the very best muffins I’ve ever had. Even better than “unhealthy” ones. Loved this recipe and will be making often! Hi! These look so great! I only have organic peanut butter at my house, can you not substitute it because of the flavor or difference in texture? Hi Haley! I just didn’t like the taste with the peanut butter ones nearly as much. The texture is fine, but the peanut butter kind of overtakes the rest of the flavors whereas the almond butter is much more subtle. Why do you say not to substitute peanut butter? My son is allergic to nuts, so I was planning to substitute sunflower seed butter for the almond butter. Hey amber! I haven’t tried it with any other butters except for peanut and almond. I say not to do peanut butter because I didn’t like the taste and it was a bit overpowering whereas the almond butter seemed the perfect complement. Just my taste preference though! If you try sunflower seed butter if would love to hear your thoughts! I made these today with a few substitutes. I used sunbutter instead of peanut butter and subbed 1 tbls of flaxseed meal mixed with 3 tbls of warm water for the egg, due to food allergies in our home. I had to bake for about 19 minutes to get them done in the middle. They turned out great! I haven’t made the almond butter version to compare flavor or know if you’d think the sunbutter flavor is more overwhelming, but we found the texture and flavor to be good! They got a two thumbs up from my son. 🙂 Thanks for the recipe! Amber – I so appreciate you coming back and letting everyone know the substitutions you used and that they worked! So helpful to everyone that has the same questions that I don’t have answers for, so thank you! I am so glad to hear that they worked out and that you enjoyed them. Thank you!! Have a great day! What to use in place of the nut things? I saw someones suggestion of sunflower butter (I also would LOVE to know how it came out). What about the flour? could I just use the oat flour for all of it? The only flour called for in the recipe is oat flour. Is that what you are asking? And you can omit the pecans if needed! These just came out of the oven and they are DELICIOUS! Followed the recipe almost exactly using a Granny Smith apple for the tartness and made 9 muffins. The only change that I made was to add some apple pie spice in with the cinnamon and a little extra vanilla. I ground the pecans and sprinkled them on top with a little extra dusting of the apple pie spice. I pulled them out right at 16 mins and the texture was perfect. A wonderful recipe!! I made these this morning and all I can say is, Wow!! They are wonderful and my husband loves them too. I baked mine in mini muffin pans and ended up with a total of 32 muffins. I’m so happy with the flavor and they taste really indulgent. I used my homemade almond butter too. Do you use raw or roasted almond butter? There is a big difference in flavour to me and these look so delicious I don’t want to muck them up! Thanks! I used Jif Almond Butter Creamy made with roasted almonds. Hope that helps!! I have been hunting a fall breakfast dessert recipe for a party Wednesday. These look perfect for it! Thank you for sharing. These sound wonderful and I plan on making them today! Do you have the nutritional breakdown of 1 muffin? I have been on a very successful weight loss journey and want to plug into my fitness app. I just pulled these out of the oven and they are super tasty! A bit like a bran muffin. I made the in a mini muffin tin since they are for my newly grain-free (except oats) 2 year old. I didn’t have any brown sugar so I used 2 T Organic Cane Sugar + 1/2 t. molasses. I’m sure brown sugar would have made them a bit sweeter, but I like that they have a more hearty muffin taste rather than tasting like a cupcake without frosting. There aren’t any flavors that are overly evident. I would maybe add a little bit more apples than I did. As is, I would definitely make these again! Thanks for the recipe! Thanks so much for your comment and feedback Annie! 🙂 I appreciate it! Glad you enjoyed this and I love hearing your substitutions for the brown sugar! 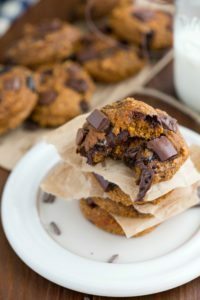 I just found your blog and I am super happy to find so many gluten free muffin recipes! And they look like they come out well, too! I’ll for sure be trying one tomorrow — most likely the pumpkin chocolate chip. I still have a few cans of organic pumpkin in my cupboard. Thanks! Thanks for sharing this recipe. I LOVE these muffins! I was wondering if you have ever doubled the recipe. If so, how did they turn out? So happy to hear you’ve been enjoying them! 🙂 I actually have never doubled them, sorry 🙁 I don’t see why it wouldn’t work though! Okay thanks! I’ll try it. ? These really are so decadent! Healthy too! Have made many times with no recipe changes and the whole family loves them. They actually remind me of pecan pie! So thrilled they’ve been a hit with the family 🙂 And yes they really do!! Ooooo I can’t wait to try these! I think I may try to substitute almond extract for vanilla extract! Thanks for the inspiration!